EverQuest™ II players are some of the most dedicated, emotionally invested players in any virtual world. For the first time, EverQuest II players have the opportunity to create parts of our world by designing new in-game items. 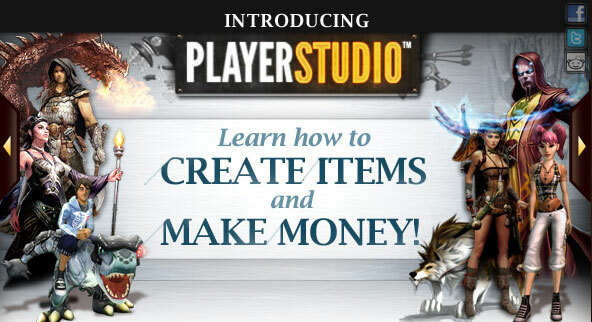 SOE’s Player Studio program invites players to download sample geometry files for actual in-game objects and through the use of standard third party art tools, learn how to develop, design and personalize items of their own – from re-coloring and re-texturing, to reshaping an item’s geometry. You can try your hand at writing a creative name, item description and rationale for how it fits into the ongoing narrative storyline. to be clear to our EU audience. We’re working on doing this for EU too. It’s very complicated due to tax and legal reasons. It’s coming! Users will NOT be making stats on items. The ones we will select we will balance properly. Although we will listen to the creators.